The rent at Super Cute! Townhouse for Rent! Apartments ranges from $1,225 for a two bedroom to a $1,600 two bedroom. Apartments in this building are about 26% more expensive than the Harrisburg average. This is a pet-friendly apartment. This apartment is in Harrisburg. The closest park is Blue Ridge Park. Super Cute! Townhouse for Rent! Apartments has a Walk Score of 11 out of 100. This location is a Car-Dependent neighborhood so almost all errands require a car. 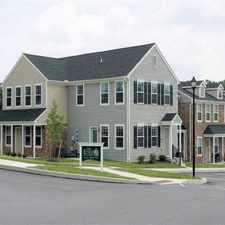 The Townhomes at Paxton Creek in Harrisburg PA can be found in the north part of the city near Paxton Church Road and Widener University. Rent here and you will have a short trip to the Harrisburg Area Community College. There are lots of large parks within a few miles of here that you may want to enjoy exploring. Wildwood Lake is along Route 322 and contains part of the Capitol Area Greenbelt trail where residents can go for a long walk or run. If you drive down North Progress Avenue you can reach the Susquehanna Marketplace where there are many popular shops and restaurants as well as a movie cinema. Spacious two bedroom, 2.5 bath townhome end unit at our newly built Townhomes at Paxton Creek community. Large eat in kitchen features oak cabinetry and all GE modern appliances. Full basement offers tons of storage and includes full size washer & dryer. Master bedroom has ensuite attached bath and spacious closet. Susquehanna Township School District. Call today to schedule a private tour! Explore how far you can travel by car, bus, bike and foot from Super Cute! Townhouse for Rent! Apartments. Super Cute! Townhouse for Rent! Apartments has minimal transit which means it is possible to get on a bus. Super Cute! Townhouse for Rent! Apartments is in the city of Harrisburg, PA. Harrisburg has an average Walk Score of 73 and has 49,528 residents.